Slim and sophisticated ... Brenta in the bathroom. 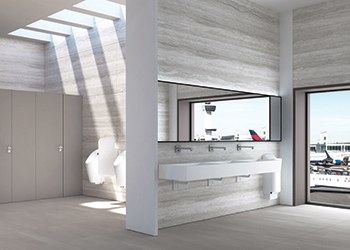 Geberit has unveiled a new electronic tap system that takes hygiene and sturdiness to the next level in public bathrooms and washrooms. Slim and sophisticated, the system can be easily installed both in the wall and washbasin and at first attempt without any errors. Electronic washbasin taps are primarily used in airports, shopping centres, schools, bars and restaurants. The particular challenge with taps used in such places is that they need to be able to withstand a lot of use, says Geberit. Furthermore, conventional taps – which are often installed in the washbasin – and their electronics are constantly exposed to high levels of dampness and moisture, which can lead to malfunctions, it adds. “With the new tap system, we have developed an impressive solution to remedy the shortcomings of touchless taps and solve the specific problems that arise when installing wall-mounted taps,” says Louise Pitt from Geberit. Touchless wall-mounted taps leave the entire washbasin free, which makes cleaning it significantly easier, and they offer sophisticated ergonomics when washing your hands. With the exception of the IR sensor, all function parts of the new Geberit tap system – such as the control, mixer, valves and the power supply – are housed in a separate, 14 cm by 14 cm function box. This is installed in the prewall in an easily accessible position under the washbasin and is therefore located outside of the wet zone. If the function box cannot be installed in a prewall, a robust alternative for exposed installation is available. 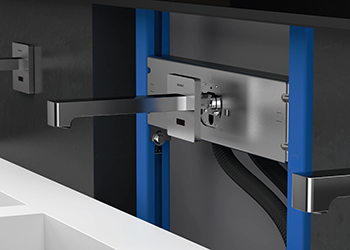 Geberit says that the reason why we see so few electronic wall-mounted taps, despite these advantages, is that there has been practically no solution for planning them safely and installing them without errors – until now. With the new Geberit system, sanitary engineers and plumbers can rely on Geberit’s innovation: thanks to integration into the Geberit installation elements, wall-mounted taps can be installed in the wall quickly and without any errors at the first attempt, just like with the installation of deck-mounted taps in the washbasin. The system includes newly designed drywall-construction installation elements (Geberit Duofix and Geberit GIS) for washbasins, which are prepared for the easy and safe installation of the Geberit tap system. They feature height-adjustable crossbars for holding and anchoring the base of the tap and the washbasin. Not only does this ensure that the tap housing is precisely aligned and firmly fixed, it also minimises the potential for costly errors. Not having the function parts located in the tap housing opens up a whole new world of design possibilities for the tap itself – a fact illustrated by the slim, timeless and elegant form of the Piave and Brenta models designed by the London-based Christoph Behling Design. Both versions are available as wall-mounted or deck-mounted taps and can be combined with practically any washbasin design. The wall-mounted taps Piave and Brenta are supplied in lengths of 170 mm or 220 mm. A special feature here is that the water is guided through a reinforced plastic hose that extends from the function box under the washbasin to the aerator on the tap outlet. This ensures that the quality of the potable water is not impaired at any point in the system. In addition to boasting an attractive price-performance ratio, the tap system also impresses thanks to its economical operation. There are three power supply options: connection to the mains supply, battery operation or a self-sustaining power supply by means of a generator unit driven by the pressure of the tap water. All components for regulating and maintaining the tap and the water supply and mains connections are housed in the function box under the washbasin, where they stay safe and dry. Valves, mixers and filters are easily accessible and can be set up and cleaned in just a few steps. The configuration can also be subsequently modified at any time – for example, by installing a self-sustaining power supply. The new tap system will be available from next month (April).